At dawn, a rhythm wakes you. First stretch the legs. Spasm; cramp. Freeze-dried food for breakfast. Ugh! Cold-blooded slurper from a fire-stained cup. Beggar; pull on your boots—it is time to get going! You must dream your way to the next valley. But this is no odyssey; you are alone with only Janne’s voice from days before for company. Six children, two wives. Benevolent cunning. By candle, far younger than seventy-two. No one remembers summers like Janne! Something deep inside, ragged and husky, barks in return. We are way-finding; navigating from soul to soul. I told everyone about Janne. And Simba—huge, slow, bear of a dog—dozy cartoon, but lightning fast if you let a bun drop. Just like his master! From Olaf in Sito to Klara in Njunjes. Telling tales in the shadow of Skierrfe, Joakim cautioned me about excess. His final verdict: Janne talks a lot. But Joakim, I want to say—one poem should talk to another. We should talk to each other. In Kiruna, I kept the final tale for Matilda—where we all became characters in a little play. At the curtain call, I hear Joakim say—good that we talk; good also that we have these huge white spaces in-between. Even your name is a folktale—giant-brother! Mumble-murmur; flicker of headlamp across a frozen lake. No one arrived as late as you and Sarah! Starting by Áhkká—you weaved a trail of your own creation. Ájtte or storehouse—skis swerving, faint and green like the aurora—you knew all the place-names; the contours, the falls. But the refuge was too hot for you that night. Not used to wood or stove—you wondered if we might leave the door open. We laughed—your physiology was snow. Nights before, somewhere in Sarek, the sleeping bag had burst; hours it took to gather the down feathers and sew it all back together. Of course, you had needle and thread! What would have spelt danger for others was merely discomfort. To meet at such odd angles that turn out to be true: a stooped frame, peering out from a wind-shelter. Boiling water that struggles against the snow. I missed you both at Tarrekaise; you must have gone further. I thought of the boy who tried to learn fear, but could not. If only we knew all the maps in your head. Giant-brother; mischief-tongued; let’s get lost in Sarek sometime again. Give my blessings to Sarah! 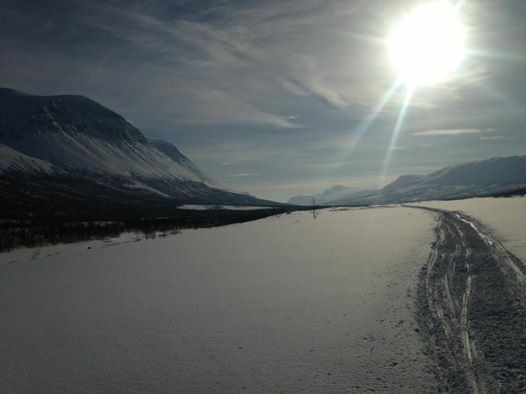 Sarek is distant—even when you are there, you are never really there. But Klara had known those valleys since she was a child. It was her playground; no one else was taught by such a master. Just to get there you have to prove yourself. Glaciers protect it; faults that lie deep move unheard. If you go, just go. No one boasts of having been there. Klara and Sarek—a wheel of strange alliance. I am very lazy, she said. I laughed. Perhaps in the way that the mountain is lazy—has no need for learning or exploration. Numberless, she disappeared in weather I don’t know. Not uncaring; it’s just that those who travelled there seemed self-reliant, quiet, stone. You must carry such a burden, and that load is lightened only if the mountain blesses you. So Klara brought everything and Sarek consented to half the load. All the rivers are frozen, but it has been necessary to ask where open water lies. Ole said: after the suspension bridge [that I had to stoop to pass under], turn left onto higher ground. Boulders and rapids are there; deep holes in the ice. Stay high for a kilometer, then drop down to the river again. It will take you all the way to Gunvor’s door. Only once did the ice give way. A whole plate collapsed beneath my weight. Sharp, low crunch—my soul dropped an octave. But it was only ankle deep. Danger for open water is often shallow. Avoid the outer bend of a river, keep to the north bank—all the rules and lore of winter. The deep lake is frozen solid. Where I did see open water, I almost felt sorry for it. The sun had cleaved down to dark veins; ice cold blood of the mountain—perfectly black. So this is how you survive. The sudden gurgle of spirits and sprites—like children in a folktale. But it is faint and sad because they do not see a soul, and no one will rescue them. Turning a bend, it is silent again. Laurence O’Dwyer is a graduate of University College Cork and holds a PhD in paradigms of memory formation from Trinity College Dublin. In 2016 he won the Patrick Kavanagh Award for Poetry. He has also won a Hennessy New Irish Writing Award (2004) and been short-listed for the Bridport Prize for Poetry (2005). His brain imaging research in autism and Alzheimer’s disease has been published in a range of academic journals and his science journalism appears in the Guardian and the Irish Medical Times. In 2016, he devoted his time to writing and long-distance mountain running, mostly in the Pyrenees. Current projects include a collaboration with Asylum Productions for a theatre performance that merges poetry, puppetry and an academic lecture about memory and neuroscience. He also collaborates with Swedish indie game developer, Macalaus, contributing texts for a game about space-travel and the search for home.